The TeleToyland Marble Maze system consists of two main components: The camera, and the control system. The control system starts on the web server, where we use simple form buttons for the Left, Right, Up, and Down commands. PHP scripts convert those clicks into commands to a NetMedia SitePlayer Telnet which connects to the Internet and has an RS232 port for the servo control board. The two servos are run from a Lynxmotion SSC-32 servo motor control board, which works well because the move over a time period commands allow for smooth movement. This Instructable covers the original construction, and is copied below. 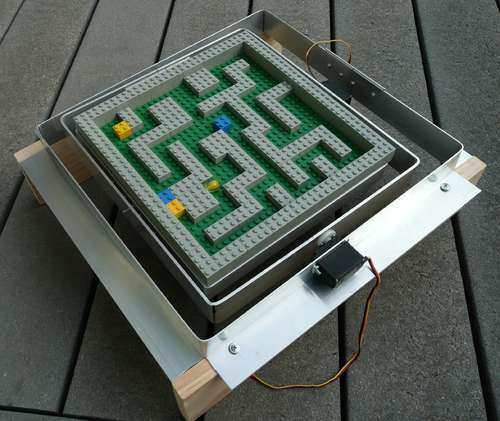 This Instructable shows how to build a local version of the maze with Arduino control. This Instructable is a new build that is easier to make.. This is version of the classic marble labyrinth, where the pan and tilt are controlled by hobby servos. With the servos, you can work the maze with an R/C controller or a PC etc. We built this one to be used with TeleToyland, and you can try it out live at the TeleToyland Marble Maze, and a second bigger one, the TeleToyland Marble Maze 2. To make setting up and changing the maze easy, we used a Lego plate and bricks.